The audience at UFC’s first ever, main event in China, saw Middleweight Asian Sanshou Fighter Cung Le delivered an overhand devastating right hook to returning middle weight champion, Rich Franklin. UFC fans worldwide, including China’s new and enthusiastic UFC fan base, were surprised by the upset, but not for Le’s Shaolin Kung Fu family. His student (Cung Le) will rise to the challenge, as Le always had before. The audience at UFC’s first ever, main event in China, saw Middleweight Asian Sanshou Fighter Cung Le delivered an overhand devastating right hook to returning middle weight champion, Rich Franklin, resulting in a knockout win at the 2:17 mark in UFC158. With a record of (9-2), and nursing a severely injured foot suffered during his August win against Patrick Cote (UFC148), Le was considered the “underdog” against Franklin (29-7). In spite of the odds, Cung Le achieved what some are calling,” the greatest win of his career”. UFC fans worldwide, including China’s new and enthusiastic UFC fan base, were surprised by the upset, but not for Le’s Shaolin family. 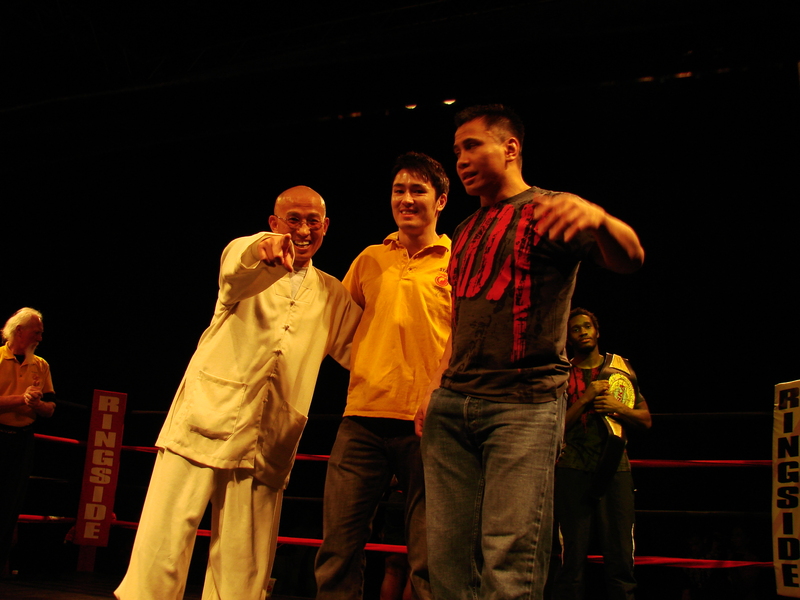 Cung Le’s first Sanshou coach and mentor, Grand Master Shawn Liu (Shi Deru), founder and President of LIU International Shaolin Institute in the southeastern U.S., knew that his student would rise to the challenge, as Le always had before, especially when Cung Le started going back to his Chinese Sanshou root, training with his old Kung Fu Sanshou team family member Scott Sheeley. Master Liu explained that while most fighters training focuses on bodybuilding and attack and defense techniques, Shaolin trained athletes receive a broad range of martial arts training focused on producing total “mind-body wellness” besides specific combat simulation dills, strategic combat awareness. In traditional Kung Fu, Tai-Chi develops not only mind-fullness, mind-body consciousness, balance, flexibility, and self-control but strategic combat and self-defense skills. Meditation frees the mind and facilitates tremendous focus and Qi flow. Shaolin Kung Fu techniques combined with rigorous Sanshou training produces athletes with superior body mind awareness, extra senses, strength, speed, skills and agility, like Sanshou champion Cung Le. According to Master Liu, one should never underestimate the ability or tenacity of a Shaolin trained athlete. Their intricate training fully equips them to rise to meet any challenge, regardless of circumstances. Cung Le is a superior Sanshou athlete who has and will continue to make his Shaolin family proud.